Him and the Others, were formed in 1964 and supported many of the major acts, as well as being backing group to chart singer Peter Fenton. 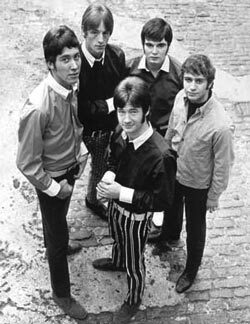 They made one record on the Parlophone label, which received rave reviews, but never achieved chart success. In 1967, following Lennie Shaw's departure from the group, they changed their name to The Hand and played the California again. Geoff Gibbs said "I remember asking our agent that when Cream were booked, to put us in as support - sure enough he did! and when we supported Bo Diddley, we lent him two of our amps, and he blew one up."